Welcome to the newest edition of Level Up My Game. It’s time once again to look at how we can make the games we love more enjoyable. So let’s talk about the wooden cube. You know what I’m talking about. If you’ve played any euro game in the past 2 decades, then you’ve seen these tiny, square pieces of dead tree. 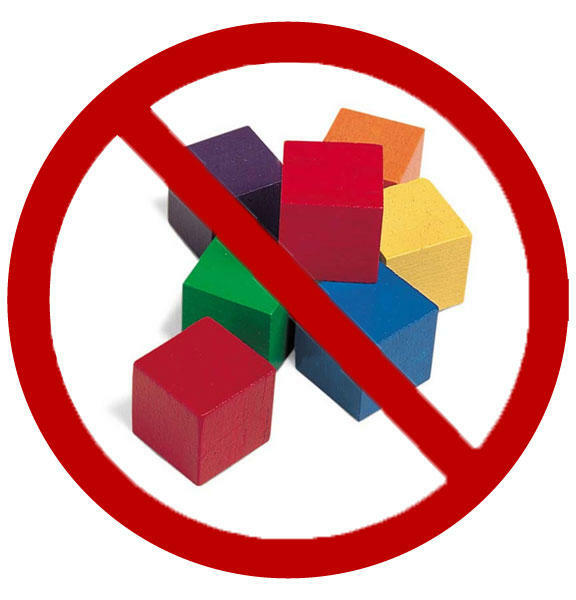 Short of the meeple, I’d be hard pressed to find any wooden component that is used more in eurogames than the cube. If I had to guess why they are so ubiquitous, it’s probably because they are cheap to produce, come in just about any color, and with a great deal of imagination, they can represent just about anything in a game. Wood, sheep, oil, people, we’ve seen it all. They are functional for just about anything, but there is just one problem with them. Seriously, is there any component less likely to produce excitement than the wooden cube? Don’t get me wrong. I like a good cube shape as much as the next gamer. Symmetry can be very calming. Plus they are fun to stack. So they got that going for them…which is nice. But come on. This is 2015, we can do better! We have machines that squirt plastic and resin into molds with fantastic detail. Yet every time I open up a new game and see one of these colorful cubes staring me in the face, part of me dies a little inside. OK, not really, I’m being a tad dramatic, but you get the point. Apparently though, I’m not the only one that feels this way. In 2014, Stonemaier Games brought us the Treasure Chest. If I had to guess, I’d say that the inspiration for the Treasure Chest came from both the outpouring of love people had for the components in Euphoria (review here), and the cries of anguish that must have been heard all the way to St. Louis when people opened the retail editions of Euphoria with its less amazing components. Not that the retail edition was bad by any stretch (especially compared to the uninspired efforts found in many euro games), but short of being frugal with your budget, no one in their right mind would choose that version over the Kickstarter edition. So one stormy night, Jamey Stegmaier went deep into the bowels of the Stonemaier HQ to his secret lab and went to work. Thus, the Treasure Chest was born. To say that gamers approved of this creation would be an understatement. The original Treasure Chest was funded on Kickstarter to the tune of $181,157 from 3,221 cube hating backers. Fortunately, Stonemaier Games must like money because they created enough copies of the Treasure Chest that it’s now available in retail channels. You can pick it up for about $40. But they didn’t stop there. 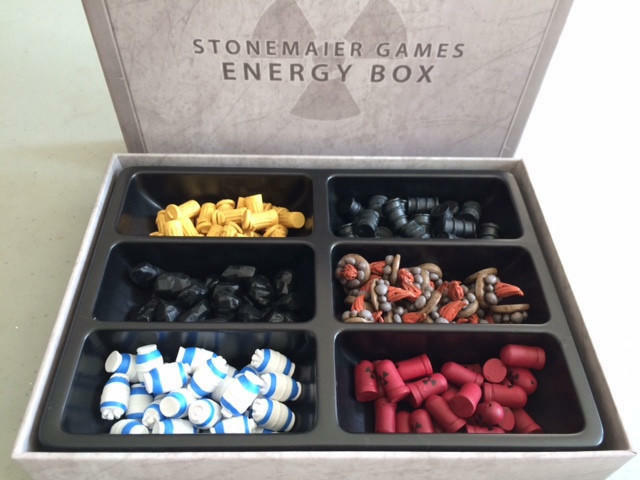 They had another campaign in 2015 for the Food Crate, Resource Vault, & Energy Box on Kickstrater. This campaign once again funded with 2,184 happy backers, earning $207,817. Clearly there is a demand here and thankfully, all are available to purchase today. So what do you get for your gaming dollar? Glad you asked! The best part of the tokens though is how they look. As someone who LOVES a thematic experience in my games, I really get some enjoyment out of using components that match the game. I think it’s because I’m a very visual person. I love to immerse myself in a game whenever possible. Swapping out bland components for realistic looking resources really adds another level of enjoyment for me. And that’s what Level Up My Game is all about. So what games are we using the Treasure Chests to improve? The one that gets the most table time with the Treasure Chests is easily the house favorite Imperial Settlers (review here). 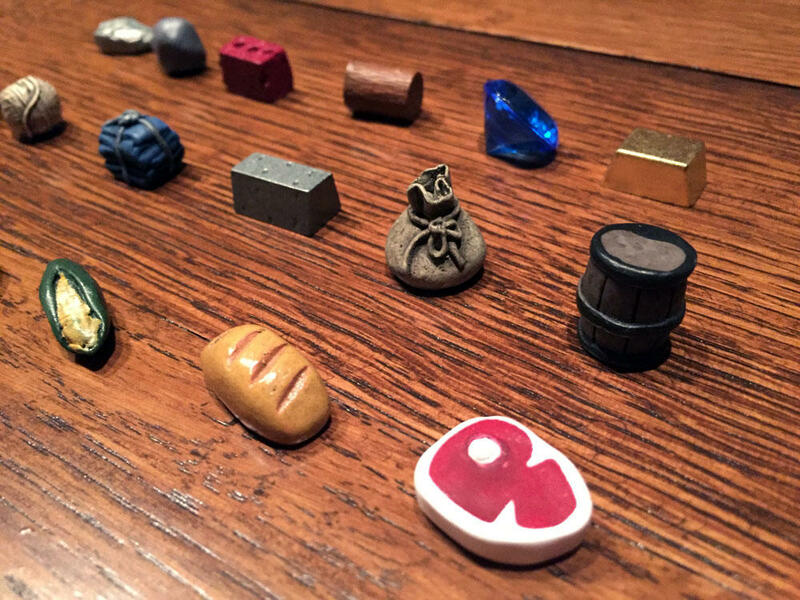 Stone, Gold, Food, and Wood are all replaced right away. Only the meeples, shields, and the swords are left over from the game. The energy box seems to be tailor made for the classic game Power Grid. If you are a fan of that energy game, than it’s a no brainer. It’s actually the only resource crate I didn’t buy, mostly because I don’t like Power Grid. But the uses don’t end there. 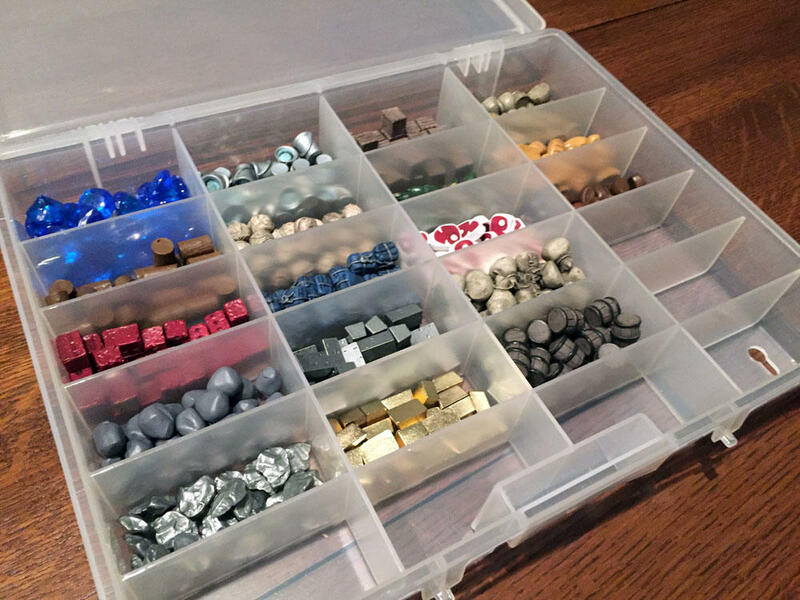 Stonemaier has a list of over 50 different games that can make use of the Treasure Chests and I’m sure that there are plenty more. While each box of resources comes with its own nice looking box, I ended up storing them all in a plano box to make transport and storage a lot easier. This way I only have to carry around 1 box. Much like Internet Explorer, Adobe Flash, and reality show talent contests, some things just need to be put out to pasture. Let’s add the wooden cube to that list. We’ve seen the other side of the fence and it looks good. I know it’s a pipe dream to think that the cube will someday meet its ultimate demise. Until that day comes, at least I have the Treasure Chests to help spice up my gaming table. You can grab yours today, all are readily available.